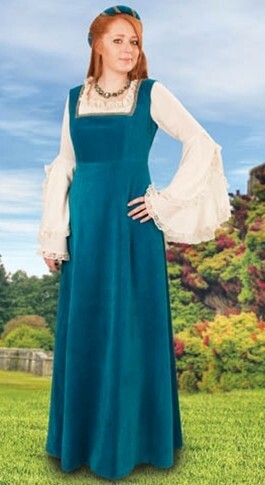 This figure-flattering Medieval Overdress is made of soft cotton velvet, available in soft green or teal. The generous length and gold-trimmed square neckline add extra style, and this dress comes with a bonus head-ring in matching color. Pictured here in green with our short-sleeved Camicia Chemise, and in teal wth our Peasant Blouse. Bonus! Matching head ring included wth dress!